In the last article I wrote to you about defining your identity clearly by asking yourself “WHO do I want to become in each of the 8 areas of life?”. Here is the link: Is Motivation Destroying Your Identity? In that article I made the point that chasing outcomes and relying on motivation is a trap. (Please note that I always write to you with pure love for your potential. I can say this with hand-on-heart because I always write using my 3 grown-up children as my frame of reference. They are my North Star. My BIG why). Please also note that this article is longer than usual because it is prescriptive and simply cannot be achieved with a brief blog. I respect you too much to give you stuff you can Google yourself. My information is proprietary and contained in my next book. I write to start you on the journey for identity change using 4 Rituals, 5 Habits and 6 Life-hacks we use in our Higher Branch workshops. Today I start with the first most important ritual – Journaling. I will share with you the simple techniques for journaling I use in my one-on-one coaching. There are so many journals out there for sale that make it too complicated and frankly too airy-fairy. All you need is a simple blank journal and a system for journaling that I will teach you. Most people don’t realise that they spend up to 85% of their day living in their subconscious in ‘cruise-control’, thinking, doing and feeling the same way they did yesterday and the day before that; effectively living in the past. This is fine if this 85% is filled with positive stuff that serves your growth. After all, the subconscious is there as an automation tool for us to do things without thinking. This frees up the conscious mind to focus on high impact, high return, high reward activities like creativity, strategy, and meaningful connection with others. But what if that 85% is filled with a lot of unwanted behaviour that just gets repeated without thinking? Stuff like procrastinating, eating too much, binge watching TV, mindlessly scrolling through social media, shopping online for stuff you don’t need, or picking fights with your family. It is difficult to erase these behaviours, but you can REPLACE them with better behaviours that serve the identity you want to create. Over the next few series of articles I will step you through each ritual, each habit and each hack that will ensure you live consciously with purpose. 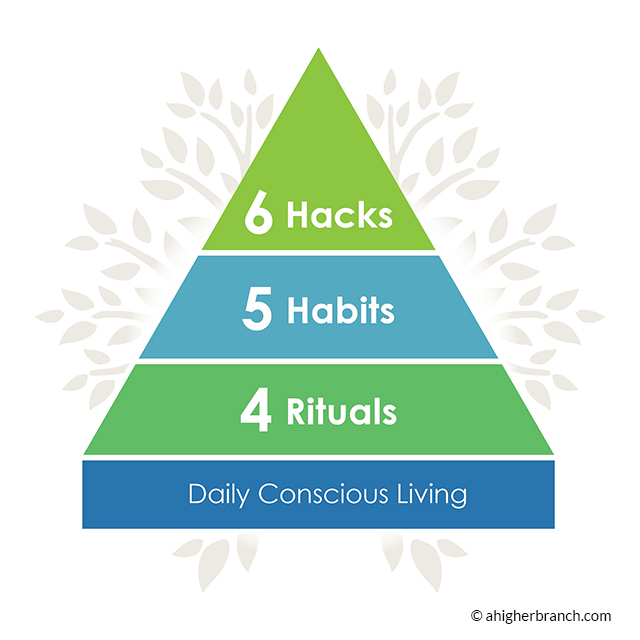 I am starting with rituals because they will become the foundation for the 5 habits and 6 life-hacks. You cannot stack the habits and hacks without mastering these 4 rituals first. The reason will become clear. Infusing these 4 rituals daily is difficult at first, but know this, rarely does anything good in life come easy. You will feel the need to skip them because you are just ‘too busy’. You need to stay committed to them until you cross, what scientists call ‘the line of automaticity’. This simply means that when you repeat something enough it becomes second nature and easier. Some scientists say it takes two lunar cycles to cross this line but in my experience it all depends on the difficulty of the ritual and the frequency in which you repeat it. The former is subjective for all of us. What is extremely difficult for some can be lightly challenging for others. What is difficult may take you many months. What is easy may only take you a few weeks. Either way, I will outline a method that works for me and I trust it will work for you. Journaling is the most important ritual out of the 4. It is also the most difficult to stick with because it can be confronting when done right. Mainly because this ritual is all about self-ACCOUNTABILITY. Ignoring it or skipping it is a big mistake because it has been the single most important success factor in my life. Most people don’t journal because they don’t know how, or they underestimate how beneficial it is. The other reason why people don’t journal is because they wake up late and hurry to get to work on time, so they skip this ritual and the three other rituals because they ‘don’t have time’. Know this. Time is the great leveller. We all have the same 24 hours in the day so the difference between us can only be our discipline and the systems we follow (i.e. our rituals, habits and hacks). You may have heard the phrase “Win the morning, win your day” which is so true, but the bigger truth is that winning your morning starts the night before. Getting organised the night before is the real secret to your morning success. Getting a deep sleep is the second biggest secret to winning your morning (Read my previous article on sleep). So, ask yourself, how do you spend your nights? This is where most people (even some high performers) waste their time because they feel like they’ve earned the right to flop in front of Netflix, scroll social media and snack. When rather it should be the time to hit repeat on the 4 morning rituals and get ready for the following day, by packing your workout gear, your work bag, your lunch, turning off all technology and socialising in person with your family or by phone with a friend. Not by text. Why is JOURNALING so important? All these reasons will become apparent when you start to journal properly. How do You Journal Properly? At A Higher Branch Success Academy, we developed a unique journaling technique that shows you how to become your own life architect. We do not like the idea of an accountability coach. People need to hold themselves accountable and journaling is the ultimate accountability tool. ​The template below gives you a guide. You need to devote two pages for every day. Once you use this template a few times, you will remember it. The left page of your journal is for your morning ritual. It is for the mind. The right page is for your heart. In the morning you need to focus on your actions for the day. So, it is future-focused. 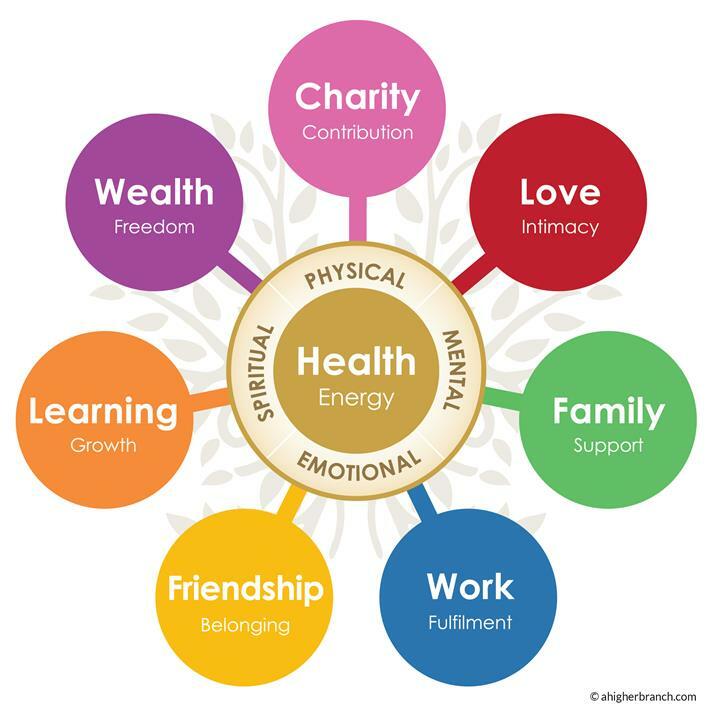 It is all about visualising as you write what you need to do for the day in each of the 8 areas of life depicted in the diagram below. (If this is your first time journaling, I suggest you devote the first few pages of your journal to write your long term goals and dreams in each of the 8 areas of life. 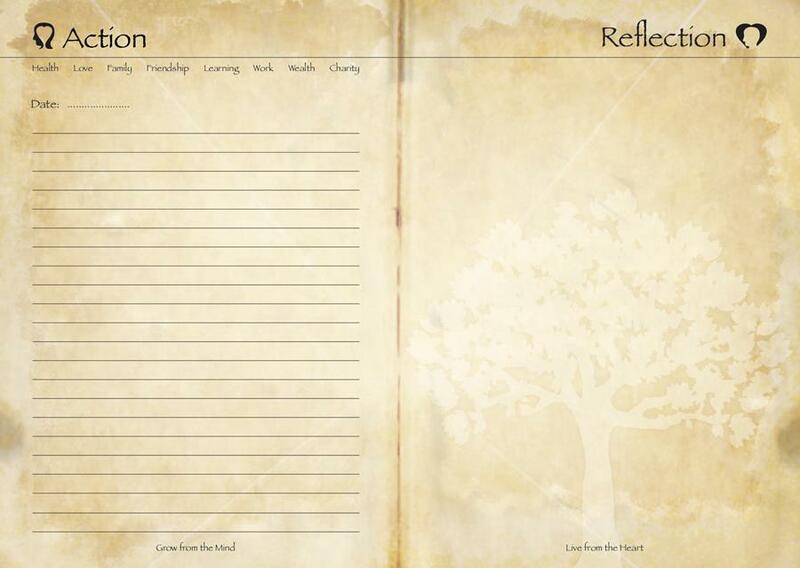 That way, the front of your journal becomes your big picture reminder to reference from time to time. Nothing is too trivial or too small to write. Once it is written, it can be reviewed throughout the day to see how you are tracking. I always keep my journal in my bag and check in throughout the day to see if I have forgotten to action anything. I do one final check before I leave work and do a brain dump at the end of the day. If I have missed anything I write it on the next day’s ACTION page to get it out of my head and onto paper so I can shut down when I get home. As a guide see below a few examples of daily action items I have written in my journal in the last week. You will notice that nothing is too trivial to write. You will also notice that there is an action item for each of the 8 elements of my life. We often make the mistake of thinking that our wellbeing is fuelled solely by diet and exercise. In truth it is all 8 elements that make us whole and complete us mentally, emotionally and spiritually. And so we cannot neglect them. Health: Do F45 today at 12 noon. Stretch for 10 minutes afterward. Book a massage for Saturday. Use the stand-up desk between 8:30am – 11:30am. Buy blue-light blocking glasses. Fast till 1pm today. Have a no-protein day today. Order more turmeric & ashwaganda. Go to bed 10pm. Rest day, do brisk walk after work. Eat out in sunshine at lunch. Love: Book a surprise dinner date for Saturday night. Light candles tonight and read together. Go for a hike together. Go home early today and cook her favourite pasta. Family: Play backgammon with daughter. Share Chapter 8 of David Goggins with my oldest son. Book lunch at a Lebanese restaurant on Sunday for the whole family. Check in on my nephew who is studying for HSC. Call mum. Friendship: Organise tickets to the footy this Sunday with mates. Call mates to organise run on Saturday around the bay. Have breakfast after. Help mate with his wedding prep. Learning: Listen latest episodes of Dr Rhonda Patrick and Jim Kwik. Research whether autophagy accelerates with exercise. Research whether coffee breaks a fast. Re-listen Chapter 11 in David Goggins book, “You Can’t Hurt me”. Wealth: Assess UBER IPO. Look into solar panels and going off the grid. Charity: Help son with setting up his new website. Spend 9am-12 noon training new recruits. Write next article for A Higher Branch community. Write cards to my World Vision sponsored children. Give legal advice and business strategy to a friend who is starting a new business. Journaling in this way helps you keep track of your commitment to each of the 8 areas of life otherwise you will end up focusing all of your time on work. I do a stock take on Sunday night for the week in review to see if I have neglected any area. This helps me pivot for the next week. There is so much more I can write about morning journaling. The right page is for your heart. It is to review and reflect on what happened during the day. So it is best done in the last hour of the day before bed. 1. To heal any hurt feelings, rejections, failures, disappointments that you had during the day. 2. To list everything that happened in the day you are grateful for. 3. To list all your achievements for the day. Processing your feelings is all about acknowledging them. The worst thing you can do with hurt feelings is to deny them and sweep them under the metaphorical carpet of your subconscious, only to manifest itself in headaches, poor sleep and irritability. You cannot hide from your feelings. If you do they will haunt you. If you confront them head-on you will neutralise them. You need to feel to heal. Did someone reject you today? How did that make you feel? You need to process it by stepping into their shoes and forgiving them. Did you make a mistake that made you feel like a failure. You need to process it by writing down what you learned from that mistake. If this is your first time journaling then I want you to go to the front of your journal and just like you listed your goals and dreams in each of the 8 areas of life I want you to devote some of those first few pages to list everything you are grateful for in the 8 areas of life to date. Then every night you should write down what you should be grateful for that happened to you on that day. Simple, powerful and effective. You may have heard of the power of a gratitude but heard little about the equally powerful task of listing your achievements in the 8 areas of your life. It will surprise how much you have achieved. We live in an era of over-achievement and most of us can be too hard on ourselves and fall into the trap of feeling like we are not enough, that we do not have enough and we do not do enough. The reality is that we have achieved a lot and continue to achieve so much daily. Listing your achievements daily reminds you of your self-worth, builds your confidence and neutralises the anxiety that lives in the gap between where you are now in life and where you want to be. NEXT ARTICLE: Rituals 2, 3 & 4.